In the initial stages of virtual museums development, on-line activity has primarily consisted of extending and modifying established forms of artistic and museological networking, presentation and distribution. In a few cases, issues surrounding the changing relationships enabled by interactive technologies are being addressed and worked through. Driven by both utopian hopes for cultural democracy, and existing expectations and needs, artistic and museological activity on the Internet could more fully engage with, and be transformed by, interactive technology. But for such activity to occur and thrive, more practical provisions must develop. Computer networks should be designed, for example, to facilitate the rapid delivery of multimedia material, increase the capacity for information storage and processing, and develop compatible programs and standards. Resistance to online activity by artworld enthusiasts must also be examined. Many dismiss the virtual museum on the basis of principles stemming from high modernism and liberal humanism in which art is constituted as a repository for the good, the ethical and the creative in order to resist the technologically-driven ravages of modernity. Moreover, systems of cataloguing, search and retrieval need to be designed to navigate the relatively boundless quantities and forms of information available through computerized networks without reinforcing the limits of established disciplinary and institutional biases. Most importantly, there needs to be an ongoing examination of the virtual museum’s sociocultural implications. For example, how will emerging forms of interactivity affect issues surrounding access, identity, community, property, governance and the creation and organization of knowledge? As the virtual museum emerges, it will no doubt inflect existing forms of museo-logical and artistic practices whose primary locus is rooted in the discursive organization of objects in physical exhibition spaces. 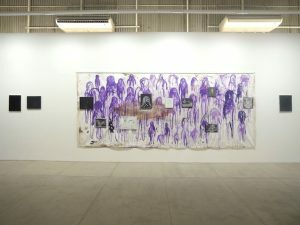 The Internet’s communication and information gathering capacities, and the ability to bypass geographically determined boundaries could reconfigure our current conceptions of museum collections and artistic spaces previously shaped by the limits of strict disciplinary, institutional, organizational and perceptual categories. In the virtual museum more flexible modes are emerging to facilitate intellectually diverse forms of knowledge that can consider the multidimensional complexity of socio-cultural, political and economic issues. While these potentials are speculative, at present the Internet’s virtual museum is emerging as an expanded, heterogeneous instance of the museum without walls. Interactivity, a primary organizing principle of the virtual museum, is constituted as a social relationship which shapes the reflexive ties between art, new media and cultural change. It is a mode of communication enhanced by technology, is used in rhetoric to legitimate the interests of corporations, and configures knowledge as a collection of dynamic and interrelated linkages. Moreover, interactivity is a political activity linking technological change to monopoly practices as well as a method through which to identify and create conditions for socially compelling expression and agency. And finally, in the interface between public and private sector institutions there is the controversial challenge of negotiating these ever-mutating boundaries to bias cultural access over monopolizing interests, and social responsibility over short-term profits. On the Net, artistic and museological activities variously engage with the circumstances surrounding interactivity. In some cases, established configurations are strengthened and extended. For example, World Wide Web home pages offer new channels through which individual works, curated exhibitions, museum services, history and contents of collections can be promoted. Web pages can address existing and potential audiences as well as inform educators and researchers. 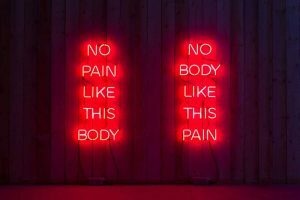 Because it offers a more direct and efficient system of feedback, the Internet can supplement existing forms of art criticism, curatorial presentation and interpretation. Aesthetic judgment, once the purview of a few experts who advised of artistic worthiness, can be expanded to allow for new forms of response. For artists and their groups, the home page is a practical and accessible forum through which to gain recognition formerly reserved for those with the economic resources, cultural connections and publicity savvy. As an information space, home pages are infinitely revisable, and can be cheaply and extensively circulated. Hypertextual and multimedia arrangements allow for more complex and flexibly organized knowledge encouraging cross referencing to other sites, networking and collaboration. In addition to distributing and displaying work done off-line, some artists are using home pages to address issues related to the changing perceptual and organizational biases of interactive media. Artists and organizations predisposed to exploring the relationship between culture, new media and institutional conditions have made especially innovative use of the virtual museum, and may qualify as the rare and provocative instances of social and cultural agency that Innis valued. For example, Antonio Muntadas uses the Internet’s expanded information gathering capacities in his project The File Room established in 1994 as an on-line archive for the ongoing collection and discussion of censorship cases. For Internet users and art-world participants, censorship looms as an unwelcome means through which irreverent and unpopular communication is contained and disciplined. Muntadas’ archive provides an open and expanded library devoted to examining the techniques and terms used to suppress information and censor expression throughout history and across the globe. Because World Wide Web pages allow for the flexible categorization of knowledge, the easy retrieval of information, and can accommodate the contributions of anyone willing to participate, The File Room represents censorship as a multi-dimensional instrument of moral regulation that is historically and culturally contingent. The network and information gathering potentials of the Internet frame Vitaly Komar and Alexander Melamid’s exploration of the techniques used by pollsters to discern public taste and opinion. In America’s Most Wanted, also initiated in 1994, the artists began surveying various publics about their preferences in painting. But rather than selling their results to marketers or politicians, Komar and Melamid used survey data to paint pictures as an interpretation of majority opinion. Unlike their marketing and political counterparts who promote their results as fixed truths, the artists use their data to discuss how dominant channels of opinion gathering and taste making are adverse to more socially democratic models of public consensus building based around discussion. Extrapolating on Komar and Melamid’s project, one can speculate about how increased data gathering capacities of computerized networks will further complicate the process of taste making and opinion gathering. Because of continuous feedback and forms of information collection and storage which are so expanded that they exceed human monitoring, it will be relatively impossible to construct certain and fixed notions of public desire and behavior. These capacities also raise questions about how personal information gathered in data banks will be regulated to balance the competing interests of individuals who will want some degree of control over how information about them will be used, and the lucrative needs of governments and marketers who will pay large sums for information about the tastes and opinions of their citizens and clients. 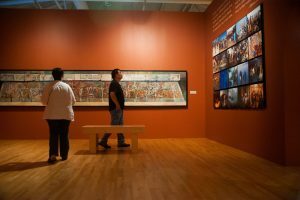 Perhaps the most contentious configuration of the virtual museum is emerging through the collaboration between public museums and private sector information and entertainment companies. One high profile example involves the Canadian Museum of Civilization, Digital Equipment Corporation, and the Quebec and Federal governments who have established the New Media Institute to develop applications for interactive media that are both marketable and will enable the museum to make its services and collection available on the Internet. Because the Canadian Museum of Civilization is responsible for the collection, presentation and distribution of national culture whose social value is priceless, all parties supporting the New Media Institute must be careful to negotiate licensing agreements and policy arrangements that will reward and encourage creators, and maintain forms of universal accessibility compatible with interactive technology while being careful not to discourage new sources of financial support and technological experimentation. While public institutions enter into new and complex arrangements with the private sector, multinational corporations like Microsoft are planning for big business as usual acquiring the digital rights to as many well-known public and private cultural collections as possible. At present, Microsoft is modeling its virtual museum as a for-profit image distribution service along the lines of the Bettman Archive to which it recently bought the digital rights. Consisting of the United Press International’s holdings and the collections of its founder Otto Bettman, the picture service was the largest and most profitable of its time. Known for its indexing system, speedy delivery service and intensive marketing, the company was a favorite source for The Book of the Month Club, Life and Look magazines. (7) Gates hopes to extend Bettman’s empire to cater not only to the needs of mass media professionals, but to the untapped potential of home computer users. Such attempts raise many critical concerns not only about universal accessibility, but also about the ethical repercussions of allowing multinational and private sector monopolies to reap huge profits from cultures whose meanings and value have been socially produced and publicly supported. The social and cultural disparities caused by monopolies and their relationship to technological change is, as Innis noted, a central and ongoing tension of imperial history. These tensions exist in our current context in the convergence of multimedia, telecommunications, computing and entertainment industries which both undermine and align with established media monopolies. But despite the great cultural displacement and social disparity that surrounds technological change, unintended and sometimes positive consequences can emerge from the chaos. In the formation of the virtual museum, it seems that unpredictable, socially motivated, widely accessible and diverse expression could emerge from the contest between supporters of the information highway for whom democratic potential is realized through market viability, and users of the Internet committed to extending its sociocultural accessibility. If compelling instances of culturally democratic expression are to be registered, encouraged and developed, it is crucial to foster modes of knowledge able to consider the benefits, and constraints, of emerging technologies as they supplement or displace more established configurations. In these very dynamic and uncertain times, it is impossible to predict future consequences of new technology contrary to the ongoing attempts of publicity and reportage. Nevertheless, it would be irresponsible to ignore the challenges interactive technologies present to established artistic and museological practice by applying the concepts, forms of theoretical analysis, policy and legal frameworks designed to negotiate the older forms of mediation. In these early stages of development, the Internet’s virtual museum can be defined as a set of social and cultural relationships being reflexively transformed by the interactive capabilities of electronic and digital media, surrounded by a plethora of unresolved, unforeseen and contentious issues, that elicit curiosity, speculation, anxiety and ambivalence. The fundamental challenge that interactive media present to established artistic and museological activity is the ability to easily, rapidly and cheaply copy, alter and transmit, for example, moving and still images, sounds, spoken language and written text. These forms of simultaneous exchange defy notions of artistic value based around originality, individual authorship and integrity of the art object. At the same time, the perceptual and organizational bias of new digital and electronic media allow for emerging forms of affiliation, subjectivity and knowledge that are contingent – shifting the boundaries between the public and private, and redefining forms of property, governance and morality. In terms of access, questions arise around whether digital and electronic technologies can create more encompassing and portable forms of storage, organization and distribution that will be available to everyone regardless of social and geographic location. 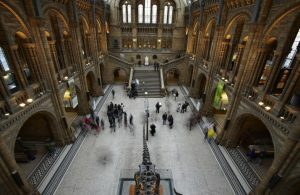 As many sources suggest, access will be segmented and exclusionary if user fees, expensive software and hardware, and the necessity of acquiring highly specialized skills to negotiate new systems of organization are required for the use of the virtual museum. 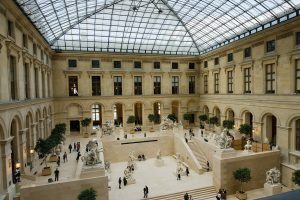 And, what does it mean for the museum’s physical embodiment – its artifacts and architectural housing – if the museum goes on-line? Whether the virtual museum becomes globally accessible, or the property of an ever-shrinking few with the skills, time and resources depends on the social practices that are instituted to negotiate and utilize the electronic and digital mediation of social and cultural institutions. If new modes of interactivity are to favour democratic expression over monopoly practices, attention must be paid to the ongoing negotiation of the social uses and governing regulations surrounding the formation of the virtual museum. Here, it is useful to consider the distinction political economist and communications scholar Harold Innis made in the early 1950s between balanced and monopolizing cultural biases. For Innis, cultural balance occurred when innovative and dynamic social configurations existed alongside those that fostered continuity and encouraged belonging. Cultural democracy could occur when provisions for dialogue created diverse, plural expression, and spaces for reflection which helped individuals and their groups to make well-informed decisions. Such a culture was supported and strengthened through the proliferation of information and communication media. Innis’ call for a multitude of communication practices fully acknowledged that the liberal rhetoric surrounding related issues of freedom of expression and universal access to knowledge obfuscated practices of exclusion and elitism. To counter liberal tendencies, he analyzed how monopolies formed when the organizational and perceptual biases of any one media predominated and operated to the advantage of existing administrative bodies. At the same time, Innis asserted that monopoly rule was cyclical. For example, those that were disadvantaged by monopolizing configurations utilized new technologies to bypass the restrictions of entrenched monopolies in an effort to establish their own predominance. Eventually, these stakeholders competed, clashed or could result in mutually reinforcing or destructive alliances. New technologies associated with the Internet’s virtual museum promise both to enhance and significantly change the artistic construction of culturally democratic spaces. Internet users can not communicate across vast territories and distanced times like their predecessors, but they have the potential to instantaneously respond to, shape and modify information circulated on the Net thereby blurring the boundaries between creators and their audiences. Interactive expression associated with the decentred and ubiquitous networking capacities of the Internet favour highly mutable forms of knowledge, subjectivity and rapidly shifting affinities. While the Internet combines the rational and visual biases of print with the multisensorial aspects of film, audio and broadcast media, the ability of new interactive technologies to digitalize information utilize modes of transmission that depend less on the human senses. Whereas other forms of media involve the extension of one or more of the senses, digital technologies transmit mathematically standardized bits of information through the electromagnetic spectrum. At the same time as information gathering capabilities are increased, interactive technologies improve methods of organizing, storing, presenting and distributing vast quantities of material. In the process, economies of knowledge associated with the Internet are potentially altered because the labour intensive processes of research and retrieval are more automated by interactive technologies. This new economy will value those who have the ability to navigate, organize and present material of relevance. Their skills will be invaluable in the negotiation of the complex, uncertain and confusing forms of communication and information emerging through the instantaneous and multiple circuits of feedback enabled by computerized networks. Because they fail to analyze how new technologies influence and are shaped by perception and social organization, current debates surrounding interactive media are usually unhelpful in analyzing the reflexive relationship among new media, artistic practice, and social and cultural institutions. These all-too-familiar arguments embrace a deterministic rhetoric that either situates technology as a utopian cure for current social ills and ignores the political and economic contexts of emerging media, or dismisses technology altogether because it is doomed to perpetuate the exploits of big business and bureaucracy. Furthermore, even though corporations and governments entertain ideals associated with cultural democracy, they are often less concerned with the social consequences of technology, using this rhetoric to legitimate their promotion of emerging media to create new markets and secure existing spheres of influence. These debates, as they are currenntly configured, characterize technology as a symptom or cure to be dismissed or embraced leaving much unsaid in the constitution of the virtual museum. 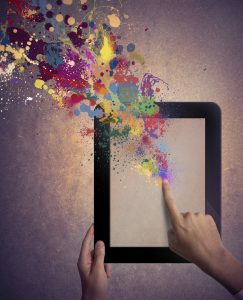 As artists and museums put their work on-line, informed discussions must consider how new kinds of interactivity will affect the way knowledge will be organized, stored, disseminated and received. 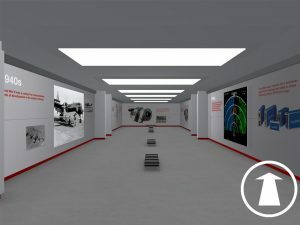 For example, will electronic and digital technologies associated with the virtual museum merely provide improved forms of expression and storage thus strengthening established socio-cultural relationships, or will fundamentally new forms of cultural practice emerge to eclipse the privileged status of visual artifacts and their related institutions? Is the global economic and political restructuring associated with interactive media proof that the information economy has arrived only to extend existing processes of industrialization and commodification to the formerly protected spheres of culture and social knowledge? Or, is this restructuring indicative of more fundamental societal change in which new technologies contribute to the overall transformation of existing forms of industry, culture, government and economy? 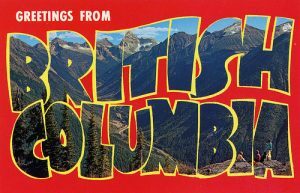 From its initial conception to its forthcoming catalogue/book, Peter White’s curatorial project “It Pays to Play: British Columbia in Postcards, 1950s-1980s” has generated great interest as it brings together a selection of over two thousand postcard views of B.C. in both a visually stimulating, conceptually inquisitive, and nostalgically rich exhibit. Presented on the gallery walls and in vitrines under a strictly gridded layout, the internal logic and dynamics of these mass-reproduced objects are underlined and point toward an archeological priority. This indexical frame provides a rare opportunity to critically survey an extensive field of visual representation that has helped to define British Columbia’s landscape in relation to constructions of nature, progress and industry. Organized along approximately thirty categorical headings as broad as “Leisure,” “Architecture,” “Landscapes,” “Industry” and “Urban Views,” and as specific as “Roads in the Landscape,” “Cars in the Landscape,” “People in the Landscape,” “Winter” and “Trail B.C.,” these postcards at first appear to be part of an obsessively objective attempt to create an encyclopaedic archive. However, looking closer we find that this inventory also provides a conceptually interesting examination of the advent of relatively inexpensive, but technologically sophisticated forms of colour reproductions. In these “chromes,” deeply entrenched formal conventions and new aesthetic devices come into play with an emerging world of industrial development, commerce and new urban communities, revealing both banal and idealized images of leisure and tourism. Reintroduced in the present as collected evidence for an investigation into a nearby past, these postcards appear on one level as either sadly naive, comically kitsch or highly nostalgic. On another level they also give insight into a stage in the formation of a touristic gaze that helped to define prosperity and progress in Canada’s most western province. As markers of an expansive tourist industry, these postcards are part of a larger scopic regime that helps to ensure that the field of vision governing land and leisure supports this economy alongside notions of industrial growth. While this ideological structure is formally referred to in the exhibition’s layout and the seemingly objective picturing of B.C., it is when the individual categories and the postcards are analyzed more closely that the reification of cultural commodities and sites break down most visibly to reveal both a production and displacement of social desires. To point the gallerygoer in this direction, White has provided a number of helpful leads starting with the form and image of the invitation card for the exhibition which is appropriated from one of many unusual pictures included among the otherwise standardized and typical postcards. As if mimicking the formal composition of Manet’s L’Exposition Universelle 1867, this 1950s image presents an unabashed modern vision of nature subjugated to commerce, industry and recreation. Elevated high above the city of Trail at a picnic area, two casually well dressed couples are seen contemplating this “progressive” fusion of industry and nature as smelters pierce the landscape in front of them. Surveying the exhibition, we find dozens of other similar scenes where a landscape, otherwise defined as “empty,” is rendered productive by the incursion of industry and technology. Among the most dramatic of these must be Cominco’s Warfield Fertilizer Operation at Trail or Bennett Dam whose architectural vocabulary and utopian pictorial space resembles the technological dreamscapes of Moon-Base Alpha. Interestingly enough, there is the odd postcard that (incidentally or not) reveals the tensions accompanying this economical expansion. For example, in Bridge to West Quesnel in British Columbia’s Famous Cariboo Country, a railway bridge traverses the Fraser River linking Quesnel’s growing community in the distance to our immediate foreground where a young native man dressed as a rancher poses contemplatively in front of a small and scraggly tree. With an analogously strange sense of narrative, a postcard in the “Rogers Pass” section of the exhibit features a pre-adolescent girl dressed in red standing alone overlooking a brand new highway that cuts through a mountain range otherwise untouched by modernity. Back-projected onto one of the gallery walls, the postcards are magnified to provide yet another space for critical inquiry. While enlarged to the size of traditional history paintings, they are simultaneously referencing family vacation slide presentations and information/advertising strategies found at park offices across the province. Repetitiously changing the images at five second intervals, enough time has been allotted for us to get a closer glimpse at the cards while also directing our attention to their mechanically reproduced nature. As a strategy, repetition is utilized in other ways as well. In a particular section, a set of identical postcards are displayed under their own separate heading. In another, we find botanical postcards repeated and organized in patterns that abstractly resemble landscape garden design. Dislodged from the exhibition’s otherwise consistently systematized layout, this section’s overt “playfulness” stands out as an odd curatorial decision slightly out of touch with the presentation’s general conception. More subtly, and arguably more interestingly, the postcards are often repeated in different categories. For example, a card showing a pink motel appears under the headings “Motels,” “Pink” and “Architecture,” drawing attention to an inevitable failure within indexical structures such as this archive to “contain” information. 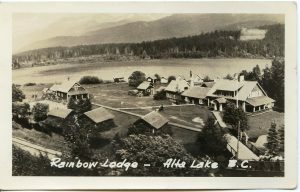 While these self-reflexive curatorial interventions do offer very important critical insight into the visual history of British Columbia, one can not help to speculate how the exhibition could have been structured differently to provide a more historically specific analysis. Wondering what subjective reminders might exist on the flip-side of these cards (the flip-side is never revealed), this particular visitor would also have been interested in a closer historical reading of individual sites as well as the specific contexts which informed the production of individual cards. Recognizing the parameters and limitations of White’s project, one hopes that the forthcoming publication will push the socio-political tensions closer to the surface by providing a more direct discussion of the displacement caused by the economic and technological optimism represented in these byproducts of capitalism’s ever-expanding tourist industry. As artists have negotiated through a revisionary paradigm of cultural and personal identity, adamant, critical voicings have been raised to defend and represent socially excluded groups. The soft-spoken murmur of Lani Maestro’s art work may seem to be in opposition to this critical tone, yet it provides something equally insistent and valuable – an emancipatory space of healing. Beneath her work’s minimal simplicity unfolds a complex series of reflections on the construction of difference through poetic and experiential means. Not that Maestro’s voicings haven’t operated under a more explicitly politicized agenda. Born and raised in the Philippines under the Marcos regime, she is no stranger to real-life confrontation between political agendas and the immediacy of survival under oppression and violence. Moving to Canada, she has maintained a symbiotic exchange between theoretical agendas and living practice. This has taken many forms including teaching, running an in-house gallery as well as a small press (the latter including the now-defunct artist journal Harbour). In relation to this more active social engagement, Maestro’s installation work can be regarded as a more internalized interrogation of identity, one whose silence encourages a self-reflexive listening. It explores a theoretical model of differentiating self from other, one that is comprehended from the presence of immediate experience. This could be seen as an oppositional camp to that of a post-colonial interrogation of social construction. Through a non-prescriptive ambiguity Maestro’s work resonates an interplay between body and space, representation and physical presence as factors in the realm of the everyday. The first half of the gallery was devoted to Cradle. Ugoy. (1996), a clustering of irregular cubic volumes made of diaphanous mosquito netting, each suspended over a woven bamboo mat by guy wires. Metaphorically this tent-like architectural grouping resembled a model nomadic city, its organic growth arrived at within the confines of the gallery walls. However by their anthropomorphic scale, these gestalt cubes of white light could also serve functionally as shelter, as a resting place to kneel, sit or sleep. The use of materials indigenous to the Philippines recalls Maestro’s childhood home. Its soothing respite evoked the healing powers of Nanay, her family’s live-in nanny, to whom the show was dedicated. A personal intimacy resonated within this structuring of space, not through autobiographical means but through an intuitive abstraction of that experience, carefully reconstructed with the simple materials of netting and bamboo. In cross-cultural terms the work reflects what theorist Kurokawa Kisho refers to as intercultural symbiosis. Seen in the light of Japan as nomadic intervener of the West, Kurokawa proposes that a cultural identity must assimilate with its “opponent” and simultaneously criticize the very construction of its binomial opposition. Maestro’s work takes on a similar appraoch through her provision of an intermediary space. This location can be traced to a Buddhist sense of consciousness that does not assimilate flesh with spirit, but instead understands its fluid and fluctuating interrelationship. A more Eastern, and specifically Japanese, sensibility of continuous interpenetrating interior/exterior space is evoked as the corridors formed between these translucent containers provide a space between a space. This integration between inside and outside could extend itself to a similar model of differentiation and co-dependence between self and other. A dialogue between Eastern belief systems and Western conceptual art seems to reiterate the workings of the Fluxus movement, which was actively engaged in an exchange between artists from the West and East. Although there is a totalizing danger in collapsing cultural difference into a transcendental whole, these artists shared an unrooted state of mutation and flux, acknowledging a global transfer of values as affecting their respective cultures. From a Western art historical perspective, Cradle. Ugoy. can be seen as post-minimal in approach. Like the work of Eva Hesse, it responds to the high formalist impersonality of minimalism with the presence of a more private, humble, self-exploratory subjectivity in pursuit of a sublime state of otherness. The heightened sense of perceptual and tactile experience of these nearly immaterial containers of their own void also recalls the spatial interventions of Robert Irwin’s scrim projects. Like that work, which takes on a phenomenological reflectivity, Maestro’s work asked the viewer to reconsider their own levels of mental construct in relation to an initial perceptual encounter. This is not to privilege a pre-language state, but instead to acknowledge the interrelation between known and unknown. Maestro’s work is a reflection of the mental processes that deduce a social and institutional organization, and in that sense it is political, proposing a radical rethinking of the construction of social meaning. A reconsideration of the structures involved with cognitive meaning could again be found in a book thick of ocean (1994). Resting on a low-lying wooden table in the more dimly lit back of the gallery was an oversize book. Each of its some five hundred pages bore the same full-frame reproduction of an ocean surface. The turning of the book’s pages in turn reproduced the wave action caught in photographic representation. This experience of “reading” expands the field of language to the physical realm, its comprehension engaged with the body through a repetitive motion of the turning of pages, as being integral to its comprehension. The ocean, as metaphor to the abyss of the unknown, is ironically reproduced as static and contained, falling short of the infinite. Sharing the back room was Akow Ikaw. Ang Desyerto. (I am You. The Desert.) (1994). Consisting of a coil of braided hair placed on a shallow base, it “climbed” upward like an inverted tornado, funnelling and connecting to the adjacent wall. At this juncture, a swarm of hand-written charcoal text, the Tagalog phrases of its title obsessively repeated, hovered around the linear cord of hair. By likening the text to hair, or hair to text, it suggested a physical embodiment of language, whose meaning is arrived at not merely by the comprehension of an abstract sign system. The trace of Maestro’s bodily presence activated the other works, acknowledging their seriality on more intimate, less mathematical terms. What becomes an issue in Maestro’s work is its potential to appear culturally transcendental. The very nature of a reductive approach can pare itself down into an essentialist idealism. The iconography used in these works infer a feminine sense of place. For example the womb-like envelope of the cradles, the ocean as fluid medium, the coil of hair as female signifiers share a history as gendered metaphors of woman as nature. In a state of self-reflection it would be relevant to question the construction of this role instead of accepting it in a circular fashion as a given. What is significant in these icons is their evocation of a nonrational force that, whether gendered or not, acknowledge the presence of an unknown to consider in relation to a state of consciousness. Instead of reinstating an essentialist polemic, Maestro’s project seems to involve the simultaneous breakdown and maintenance of differential borders through a simple confrontation with the physically immediate that provides a more profound understanding of lived experience. Cradle. Ugoy. considered immediate bodily experience and the physical presence of the unknown as neglected factors involved in the exploration of a notion of cultural and personal identity. Instead of proposing a textually privileged strategy that remains no more than a prescriptive polemic, Maestro’s work reveals a symbiotic interchange between form and content, theory and practice. Through this reflexivity it provides the means to consider a new configuration of the aesthetic in relation to cultural practice. It creates a presence of compassion, of wonder, to approach a knowledge of the world through the trusting of intuition. Unconditionally, a sense of care resonates outward to the everyday, living a sense of difference and identity through a state of reflection on the immediacy of living in the complexity of cultural diaspora. 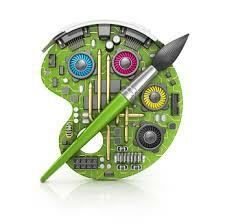 The arts are very much concerned with today’s technologies. Numerous works reflect this in one way or another, even if the techniques and machines are far from apparent in most cases, and have a role only in the processes of creation. Few are indifferent to these new technologies and the issues they raise, for they force us to reconsider certain questions about art, society, the economy, the environment, communication, and our view of the world. In this respect, Eric Raymond refers to a “conditioning” of our preoccupation with machines. WHAT TECHNOLOGIES ARE EXAMINED IN THIS ISSUE? Video should perhaps be mentioned first, as it is the oldest of the recent technologies. This constantly evolving medium is the physical support (magnetic tape) associated with the very first conquests of the image: photography and cinema. The subsequent technologies cannot be regarded as supports in the 19th-century sense of the world. The arrival of the computer as an artistic tool represents a break with certain modes of apprehending the world and of reproducing its image. Henceforth, its representation would be calculated and rendered interactively. Practices derived from computer technology include digital images and sound, virtual reality and on-line artwork. The hybrid forms and intermediate phases that combine computer and video, digital images and real images, for example, are also important steps that should not be overlooked. The medium of video is now thirty years old. This span of time may seem short compared to cinema and photography, which have passed their centenary, but long compared to the spate of new technologies that have emerged in recent days. This seniority, as it were, has allowed video to incorporate a critical dimension that puts into perspective certain concepts that have arisen from the modern aesthetic tradition. The methods and means used primarily in fields of communication, such as the Internet, give rise to an entirely new set of aesthetic issues; as yet, we do not have enough data to judge whether or not these will generate new artistic practices. Nancy Shaw considers this question in social and economic terms, questioning the notion of interactivity and the museological institution. Certain sites, however, have already been explored by artists who are testing the modes and applications. As for virtual reality, experiments are being conducted primarily in the scientific and military sectors. For artists, virtual reality would seem beyond their reach. Only those researchers affiliated with scientific experimentation centres have access to these tools and the necessary technical support. The hypermedia (CD ROM, DVD), on the other hand, were appropriated by some artists as soon as they came out. The medium of virtual reality can be viewed in terms of a certain continuity, as it was prefigured by the cassette and video installation. The viewer is now more than ever at the centre of things. Certain technologies require that the viewer be intimately connected with the work (hypermedia, for example), while others operate according to a hybrid mode which forces the viewer to navigate between extremes. Does the interactivity mentioned in each of the articles stem from the practices themselves or is it an extension of the “place of the viewer”? So far, technological theory has predominated over technological practices. A considerable number of articles, reviews and books have advanced the most extravagant theses, but always based on research into the specificity of the various practices, isolating them from any type of contextualization. This phenomenon has generated utopian claims – sometimes paranoid, sometimes euphoric – about tools which require manipulation and transformation, and about practices which still await analysis and conceptualization. The theoretical texts on the subject are at the inevitable stage of defending specificities and isolating the territory from any cultural context. Parachute’s second issue on this theme looks at the problem from this perspective. David Tomas speaks of the schizophrenia resulting from this dual attitude: a critique of the quest for progress and a search for contexualization on the one hand, and a questioning of newness and a search for specific identity on the other. 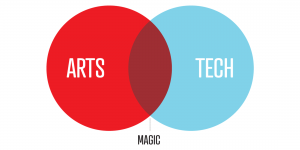 As the interviews indicate, most artists pay scant attention to these new techniques, and in fact show a certain opportunism: they use them for a predetermined project with a fixed idea in mind. Rarely, these artists admit, do they engage in technological research or contribute to technical advances. It is the theoretical project, the ideas and concepts, that are of lasting significance, not the methods employed. Visual artists like to work alone, whether in the studio or elsewhere. They are therefore generally on the lookout for technologies which are easily accessed, the less complicated the better. For this reason, the machines they use have most often reached a stage of wide commercialization, being easy to master and accessible to all. Certain specialized centres producing and exhibiting works and engaging in theoretical reflection have also arisen over the last decade: ZKM in Karlsruhe, ICC in Tokyo, and the production centre in Banff. The development of technologies may appear to be linked with the development of memory. Today, numerous artists explore the archives and reassemble the fragments of history. New technologies would seem to help us preserve the memory of time and history. Instead, the reverse has occurred. The more the various media have improved and advanced, the less they have withstood the ravages of time. Papyrus is still our most reliable support. Paper, paradoxically, which was invented years later, is less stable than the papyrus of our ancestors. The same is true of technological supports: CD ROM is already considered less durable than magnetic tape. Computers have an announced life span of three years; video material, five. Ironically, these technologies which were supposed to preserve our historical memory have instead accelerated the process of amnesia. This historical loss would seem to coincide with a territorial expansion. Network technologies, which everyone speaks of today and which many of us are starting to experiment with, denote a profound change in our sense of perceived space, which is no longer seen from the single, homogenous point of view of the Renaissance tradition. Our world-view has become anisotropic and entangled in a complex, inter-relational web. WILL ARTISTS EMBRACE THESE NEW MEDIA? The ideas that may result from this new vision of the world, from our permanent relationship with others, from our new presence/absence with regard to the individual body, from our conscious relationship with the environment, from the unstable economies of countries and continents – will these ideas require new artistic practices?